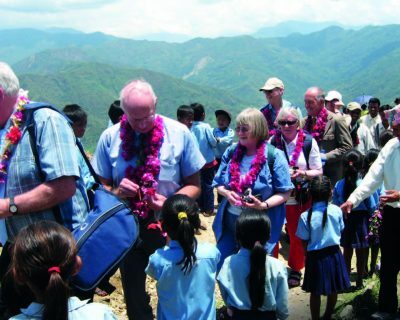 Nepal is a fantastically friendly country and a favourite McCabe destination. On our classic itinerary, we see the sights of the Kathmandu Valley, go on safari from a jungle camp and stay in an idyllic Himalayan resort with breath-taking mountain views. There is also the opportunity to fly to the summit of Mt Everest. The McCabe Educational Trust supports a school, high in the Himalayan foothills and a visit here is always a highlight. We have been associated with the school for more than twenty years and the children give us a wonderful welcome. We start and end our tour in Kathmandu where we have the opportunity to visit the principle sites. We then experience a two night stay in a jungle camp where we look for white rhino on elephant back.